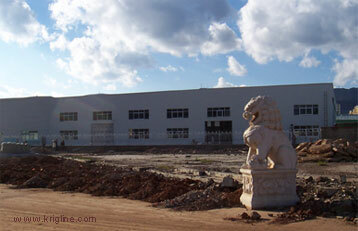 Don't miss "page 1", and you can reach lots more "China photos" from our photo index page! 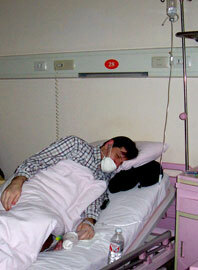 (left) This is Michael in the hospital--a grim reminder of how ill he was before receiving two weeks of treatment for pneumonia in January 2005 (doctors said that Xi'an's pollution was the cause, and advised us to move to a city with cleaner air). We find it interesting that the hospital's main symbol (right) looks a lot like the Madonna and Child. You can also learn the origin of the "snake on a pole" symbol (on the hospital's ambulances) in Numbers chapter 21, verses 4 to 9 (that's in the Bible). Jesus also refers to this in the book of John, chapter 3, verses 14 to 18. Michael left the hospital on January 20, 2004, and flew (the same day) to Qingdao in northeastern China, looking for a job in a less-polluted environment. This windy port city was controlled by Germany before the Japanese took it over in the 1930s. The Germans built breweries here, and ever since then the city has been the home of China's most famous beer (Tsingtao). 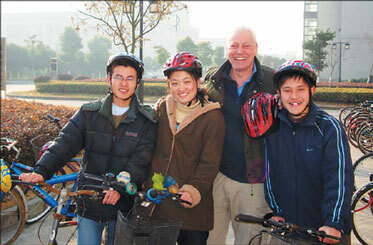 (Michael wasn't happy with the job prospects there; so we turned our attention to Kunming.) Michael left Qingdao a week later, and was joined in Hong Kong by Vivian and Andrew for an annual conference for Jian Hua Associates. 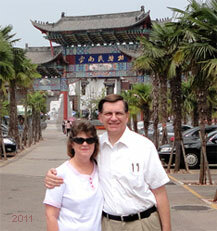 After a week in Hong Kong, we headed to Xiamen. 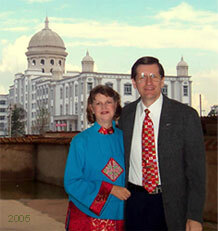 Vivian and I (shown in front of the main "Business School" building in 2005, and then near the Terra Cotta warriors in 2011) enjoy being here to help in whatever way we can, seeking to equip tomorrow's leaders with the language tools they need for success in the 21st century.  By creating a textbook, we feel that we have made a lasting contribution to China's development, though each life we touch is also part of our "lasting contribution." If we can help students and colleagues to embrace the virtues and values that have served mankind well for millennia in the process, then all the better. To paraphrase a great leader, what good is it for a person or nation to gain material success at the expense of his or her soul? That which can be seen is temporary, but that which is unseen is eternal. When I see a sign with substandard English, it just reminds me of how important my job is! Most of the mistakes are small, but sometimes they really get it wrong. Notice that the letters are not backward; they just wrote them from right to left. My guess is that the people in this sign company just don't use English much, and so they mistakenly assumed that both languages can be written "front to back." Oddly, when I show this picture to students, many don't know what is wrong. 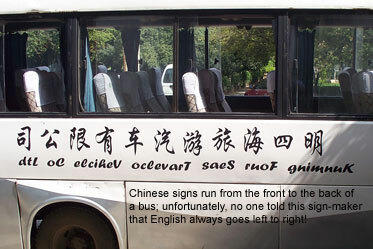 I guess they can read the English just as well left-to-right or right-to-left. But if you ask them to read something in ALL CAPS, that gives them a lot of trouble. Can Chinese people buy homes? Well, not really. They buy homes on land that is leased from the government. Click here for more info (look for the word "purchased"). I don't try to hide the fact that I don't like being a judge for English competitions (mainly because I don't think it is fair to judge someone's language ability from a short speech), but I must also admit that it is gratifying to see the fruit of hard work obvious in these competitions. It is also great to see how happy the winners are! Another benefit of judging is to meet other teachers, often from a variety of schools. In my experience, most foreign teachers don't have much contact with our Chinese colleagues because we (both foreign and Chinese) are all very busy with our teaching duties. But I've enjoyed the occasional chances to work together. Officials from Yunnan Province (one is a close friend) invited us to join them for some of Xiamen's delicious seafood during a break at the 16th China International Fair for Investment and Trade (第十六届中国国际投资贸易洽谈会, Sept 2012). 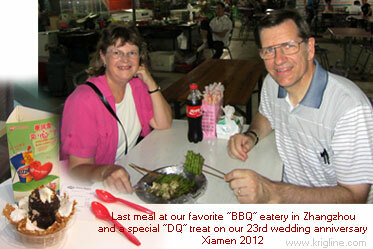 They tried to persuade us to return to Yunnan, and on Xiamen's hot summer days such an invitation might be hard to resist! (Right) More special treats in the summer of 2012.